If you have a cough associated with heartburn or a burning sensation in the lower chest, you may need treatment for GERD cough. Treatment for GERD cough can also help relieve other symptoms of acid reflux such as belching, impaired swallowing, wheeze or chronic cough after eating. What are the signs of a GERD cough? If you have a chronic cough, there is 25% chance that GERD is causing your cough. 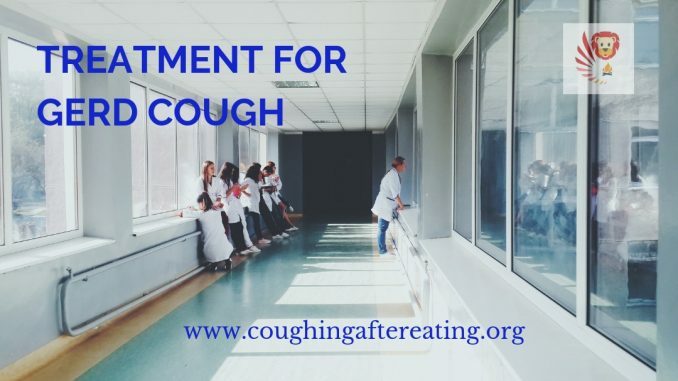 Before you start treatment for GERD cough, you need to make sure your chronic cough is indeed caused by GERD or acid reflux. Typical signs of GERD cough include the below. The above symptoms may indicate GERD but to confirm whether you have GERD, you need to see a doctor. Heartburn is also a symptom of GERD but some people do not experience heartburn though they have GERD. What causes GERD cough in adults? There could be a wide range of reasons for GERD. Experts say GERD commonly occurs when the esophageal sphincter becomes weak. When esophageal sphincter is weak, semi-digested food from stomach and acids from stomach can easily travel upwards and enter the esophagus. Esophageal sphincter is often weak in smokers, obese people and pregnant women. So, it is fair ro say that smoking, obesity and pregnancy can cause GERD. GERD can be triggered by certain foods like the below. Acid reflux is common in infants under 1 year of age. Almost every time they eat or drink something, they spit up or vomit a little bit. Such acid reflux in infants normally disappears after 1 year of age. If acid reflux symptoms do not disappear after 1 year of age, it could be GERD and requires medical help. Common symptoms of GERD in children after 1 year of age include the below. It is extremely difficult to say whether a child is having GERD or not as they cannot describe their symptoms. However, children often show certain behaviour when they GERD. So parents need to look out for the below behaviour. GERD diagnosis is a bit complex and difficult one. If a person has chronic cough for no apparent reason and no heart burn, it is even more difficult to diagnose the chronic cough. Other conditions like asthma and post nasal drip also cause chronic cough without heartburn. Your doctor will perform few tests on you as part of GERD diagnosis. A test called Esophagogastroduodenoscopy or EGD or upper endoscopy helps evaluate chronic cough symptoms for GERD. This test allows the doctor to examine the lining of the esophagus, stomach, and upper part of the small intestine. Sometimes doctors install a pH probe to monitor esophageal pH for 24 hours. If the pH probe shows acidity in esophagus, it suggests GERD. Another test popular for GERD diagnosis is combined esophageal multichannel intraluminal impedance and pH monitoring or MII -pH. MII -pH is also helpful in treatment of GERD and its complications. Sometimes doctors use proton pump inhibitors or PPI for diagnosis as well as treatment of GERD. When a patient sees a doctor with symptoms similar to GERD, doctor can prescribe PPI to the patient and monitor the progress. If PPI helps alleviate the symptoms, this in itself confirms GERD diagnosis. In the past, the most common test for GERD diagnosis used to be barium swallow test. However, doctors no longer recommend this test. GERD is one of the main causes of coughing after eating. As a result, GERD cough can make your life very uncomfortable. Treatment of GERD cough is hence important. Once the doctor diagnoses a GERD cough, patients obviously start looking for treatment for GERD cough. Treatment for GERD cough often starts with making some simple life style changes. If life style changes do not help treatment of GERD cough, your doctor may offer you formal medication or surgeries in more serious cases. This type of treatment for GERD cough involves understanding what triggers GERD cough in you rcase and avoiding that trigger. By making life style changes as below, you can start treatment for GERD cough. Certain simple medicines available to buy over the counter can help in treatment of GERD cough in many cases. For more serious or chronic cases of GERD cough, doctors can prescribe medicines. When life style changes or medications do not help in treatment of GERD cough, doctors recommend a surgery. The most common surgery for treatment of GERD cough is fundoplication. Fundoplication is normally done via a laparoscopic surgery and so is minimally invasive. During this surgery for GERD, surgeons wrap or plicate the upper part (gastric fundus) of the stomach around the lower end of the esophagus and stich it in place. This helps re-inforce the closing function of the lower esophageal sphincter. With the stronger lower esophageal sphincter, contents of stomach just cannot re-enter the esophagus and so no more GERD cough.